I am up in Sitka visit family. 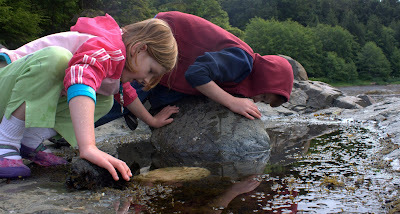 One of my niece and nephew's favorite activities is going to the beach and trying to catch bullheads (little fish) in the tide pools. This is a great time of year to be down at the beach because there are some of the lowest tides of the year so a lot of interesting things are visible that normally aren't. I really enjoy watching and listening to the ravens while I am up here. 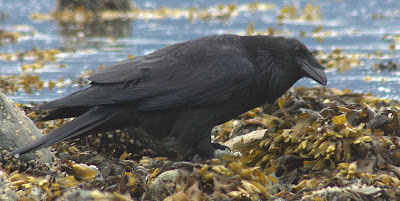 I run into ravens on occasion in Washington, but they are very common around Sitka so it is a lot easier to observe them. This one was pecking in the seaweed finding things to eat. Mount Si seems to be the classic Seattle hike. 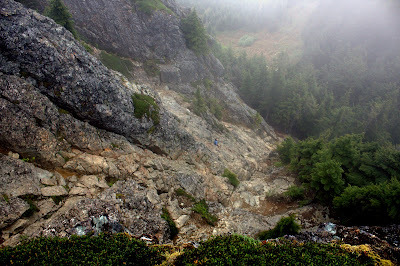 Generally if you live in Seattle and like to hike, you've hiked Mount Si at least once if not several times. At least that is the impression I get. I like to think of myself as a hiker, though if I look at my actions for the past several years, I'm not sure how accurate it is to apply that label to me. I get out and do naturalist wanders frequently, but not so often do I go on what I would consider a hike. But after living in the Seattle area for 4 years, I finally got around to going up Si yesterday. I would call the hike moderately strenuous - 4 miles each way with an elevation gain of a bit over 3000 feet. Fortunately battling my carpal tunnel syndrome has helped get me in better conditioning in recent weeks (exercise seems to improve my symptoms for some reason), so I felt reasonably comfortable. The weather was cool and overcast, I'm not sure if that was a detractor for hikers, or considering the recent heat wave perhaps it was a motivator. At any rate the trail was very well populated, even quite a few people still starting up as we were reaching the bottom in the late afternoon. I enjoyed walking up through the woods - it reminded me a bit of some Sitka hikes. 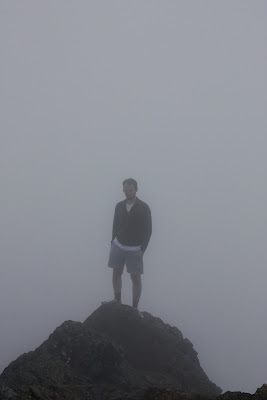 Unfortunately the view from the top consisted of thick clouds - guess I will have to go up there another time when the visibility is better. I was quite curious about the hay stack (a large rock outcrop at the top of the mountain). Last year I had talked with a friend who had warned me about how crazy it was and how it shouldn't be attempted. Of course that just made me more interested in giving it a try. I thought it was fun (apparently there is more than one trail up, I'm not sure of the relative difficulties of the others). I enjoy going up stretches like that in part because they are exhilarating but not exhausting. Julie at first decided she was not going to risk the climb, but when I got to the top and looked back to see if I could see her at the base I was surprised to see her half way up. We even managed to coax her up the last twenty or so feet to the very top, quite a brave performance. The other day I was walking through the park near my house and I heard a stellar's jay making noise and some winter wrens chittering all from the same area in the woods up the hill from me. I was curious what the racket was about, so I stopped and watched for a minute or two and was rewarded with the site of a large bird flying up into a large cedar near the kerfuffle. I slowly made my way up closer to the tree. At some point I had made enough noise to have alert the birds, the jay flew off and I made my way with slightly less care (it was difficult to proceed quietly through the dry leaves and sticks). 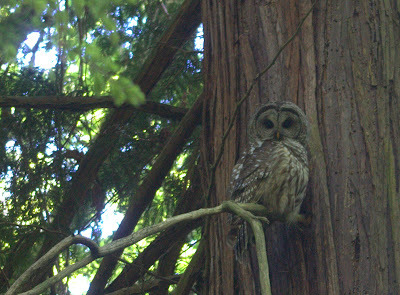 I worked my way around to a pretty good view of the barred owl. It saw me, but didn't seem to care too much. I expect it was quite used to people considering it lived in an actively used park in the middle of residential areas. The winter wrens continued chittering, though they didn't seem overly concerned with the owl (or with me). I did witness a bit of chasing of each other and some preening going on, so perhaps their irritation was mainly male aggression and the owl being there was coincidental. In the past few weeks I've seen owls several times. The rest were out of town and were all great horned owls. 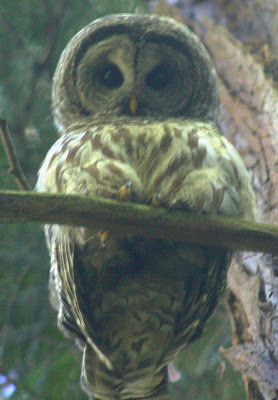 I feel more kindly towards the great horned owls, but this was my favorite owl sighting of the bunch because it is the only one where I think I was aware of the owl before it was of me and it wasn't just blundering luck that I ended up seeing it.